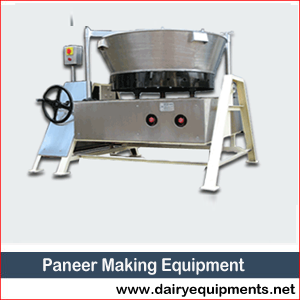 Our Paneer Making Equipment is esteemed in the milk products producing industries because of their very fast & time-saving functionality together with the quality of the output produced. The rapidly operating feature is very advantageous for those who prefer to produce huge quantities of paneer. The machine firstly coagulates the milk introduced by the acid provided at a very high temperature and then presses the material such that excess whey is eliminated maintaining the right amout of moisture in the paneer. Our equipment by means of the most sophisticated technology and is prepared in obedience to the global quality norms using the premium quality basic materials. The design as well as the fabrication of the machine gives the same exceptional features like fast, competent and consistent performance, permanency, hygienic results, user-friendliness, unproblematic maintenance, minimal power consumption, safety etc. These are very genuinely rated.